1. Place 50g of the butter in a bowl and whisk over a pan of simmering water until softened. Remove the bowl from the heat and whisk in the soured cream and soft cheese. Return the bowl over the pan of simmering water and whisk in the remaining butter until fully incorporated. 2. The mixture may appear to split, but keep whisking over the pan of warm water and it will come back together. Stir in the lemon juice and salt, transfer into a small bowl. Keep in the fridge until required (for up to 2 days). 3. Using a spatula, spread the soured-cream butter on all the slices of brown bread. 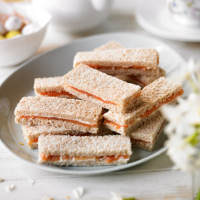 Place the thinly sliced salmon on top of three slices and sandwich with the remaining slices of bread. Using a serrated knife, trim off the edges and cut each sandwich into 3 x 9 cm fingers.